VLR Treatment – Removes fine lines in areas of the neck, under the eyelid, hands and décolletage. The treatment is electronically assisted for more comfort and accuracy. The VLR Treatment is given in small quantities along the lines & wrinkles, and is evenly spread over the surface area that is being treated. In this way nutrients and Hyaluronic acid is directly introduced into the dermal layer of the skin. A treatment session lasts 20 mins. The skin will be less creased and more hydrated. The skin becomes firmer and looks increasingly radiant. 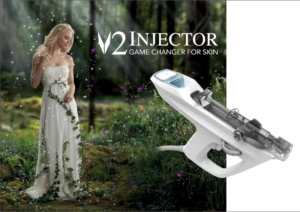 The V2 injector gun is a delivery device that allows the practitioner to place the Beauty Booster with Redensity reliably beneath the skin. It offers precision depth and accurate dosing for a quick and effective treatment with minimal pain and downtime for patients. The V2 injector gun can be used with multi-needles – the nine-point for the face and five-point for areas such as the hands. This increases the speed of the procedure and decreases the sensation relative to single needles, as patients do not perceive the multiple points. The device works by applying inbuilt suction to the skin prior to every injection. This decreases the sensation and vascularity in the area, improving comfort and the accuracy of the depth delivery, ensuring a more uniform treatment. In addition to use on the face, the V2 injector gun can also be used on the neck, which can be a difficult area to treat with success. A session consists of intra or hypodermic micro-injections given with a fine needle or very small quantities of Redensity [I] along the lines of wrinkles and evenly spread over the surface of the whole face. In this way the Redensity [I]’s HA and nutrients arrive at the heart of the skin. The injection may be manual with syringes and needles, but also electronically assisted for more comfort. Will I be able to start working immediately after a session? The results are seen immediately at the first session. The skin has a better colour, is less creased, better hydrated and becomes more supple. Gradually, from one session to the next, the complexion looks increasingly radiant and the skin becomes firmer. The micro-injections are shallow and performed with very fine needles. For better comfort throughout the injection session Redensity [I] contains lidocaine which is a local anaesthetic widely used in the world. For enhanced comfort it is possible to apple an anaesthetising cream before treatment. For an optimum result, an initial protocol of 3 sessions and a maintenance session 2-3 times a year are recommended. My impression is that my face is firmer, my skin replenished… I feel better about myself. The result is natural and this is what I was looking for. I instantly recovered a healthy glow, everyone told me so.